What a catch! Mount a cruelty-free trophy to your wall with these recycled cardboard animal heads. On the hunt for the most interesting home decor? 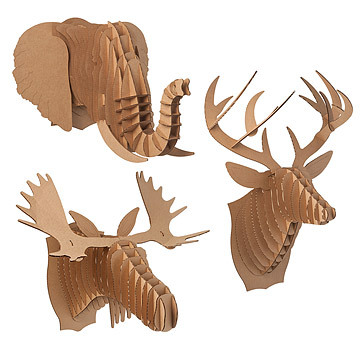 More modern design than hunting lodge, these clever, cruelty-free cardboard deer and moose heads are a fun way to add a trophy to your wall without having to go after Bambi's mom. Easy to assemble, the kit includes numbered cardboard sheets and detailed instructions. Designed by Luis Rodrigalvarez of Cardboard Design. Made of 100% recycled cardboard in Virginia. Choose between Bucky Jr. or Sr. (deer), Fred Jr or Sr. (moose) and Eyan Jr. or Sr. (elephant). Spanish designer Luis Rodrigalvarez discovers new ideas from traveling in airplanes, subways and cars. "The process of being in motion to another place makes me think from a different perspective and gives me time to turn ideas around in my head." When starting a new design he considers the material or the tool as these define the possibilities and limitations. "The fragility, flatness and strength are the main characteristics of cardboard that drive my projects and spawn many small sketches and notes." The Grandchildren call their Granddad, Moose. My son LOVED his Moose! My son loved putting it together and hanging it in his room. Easy to assemble and so unique! I had been looking for a "faux" deer head for quite some time, and I think the "cardboard safari" version is so unique. I made a few DIY changes -- I covered the antlers in patterned washi tape, and covered the back piece in paper flowers. I think this is a really special piece in our living room, and I get a lot of compliments. I saw the design in a model home and thought it would be great for a daughter who wanted something unique for her bedroom wall. She put it together in minutes and mounted it without any help. The pieces are sturdy, so we weren't worried she'd break them during the assembly. It looks great. I love this cardboard deer head-- it is so fun and whimsical! I actually purchased it for a work event and it was a big hit. Even though I measured before I purchased, it still seemed a LITTLE small for my liking (and for the price), but I thought the larger one would be much too large (for my purposes). Easy to put together and seems sturdy although I would consider gluing the actual head parts onto the plaque parts if I wasn't just using this for a temporary thing. Overall, it is a super fun product, guaranteed to get you lots of smiles! My nephew already had one, but had fun putting it together. He was happy to have a pair! I bought this to use for our son's nursery and it's absolutely perfect. You could spray paint it for some color, but I love the cardboard! If he ever grows out of it I'll use it for my own decorating. Ha! I was a little intimidated by the number of pieces it had, but they were SO EASY to assemble! If you can match numbers together, you can put this together. I was also concerned I'd ruin a piece when removing it from the cutouts, but that was fine as well. Great quality, great product.